At the close of the year I want to share a bit about our life here in the village. A lot of people have asked me how things are going here in Nova Scotia, so my plan is to share these stories about once a month. It’s relevant because this place has become an important piece of my creative journey. Throughout our adventure, I trusted my intuition (which for a former computer consultant is a big deal). I’m happy to report that intuition hasn’t led us astray yet. In fact, the one issue we ran into (with the movers) happened because I ignored my gut feeling and went with the logical choice. So based on a “feeling’ that this was the place for us, it seems we landed in the right place. And all those horror stories you hear about getting the cold shoulder or nosey neighbours in a small town? Not true here. We’ve been made to feel at home since Day One and friendships are growing. One of the pluses of our new home is the village post office which sits directly across the street in a sweet little frame house, complete with wrap around porch. 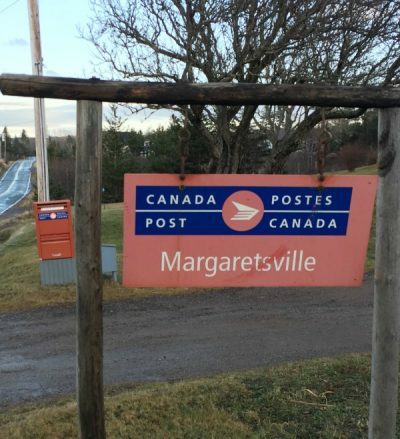 A red mailbox and sign at the end of the driveway are the only indication of its official capacity. Last June, after we closed the deal on our house, I went across to meet the postmistress and felt like I’d stepped back to a gentler, more charming time. Up a few steps to the porch, a ginger cat greeted me. After giving him a pat (and receiving a purr in return) I pushed open the door and entered a comfortable room complete with a worn wood floor and scatter rug. Through an interior window directly in front of me, I could see into a kitchen so this was obviously part of someone’s home. Of course there were the usual things you find at a post office like stamps and packing materials but directly to my left were shelves full of paperback books. A Tiny Free Library! A very good sign that this place and I were going to get along. At the other end of the room stood an old fashioned wood counter in front of more shelves divided into slots, all neatly labelled with names. A woman entered through the kitchen door and I met Debbie the postmistress for the first time. Picking up your mail here is not a faceless, impersonal chore. In this day and age of community mailboxes, she actually retrieves your mail from one of those slots and hands it over, complete with a warm smile and a greeting. On that first visit, Debbie reserved our slot and marked on her calendar the date of our official arrival. As a result of that simple act I knew we were moving to a special place. We wouldn’t be just nameless “new people”. We would be neighbours. Once we arrived, Debbie became an information resource as we settled in. More importantly, we now count her as a friend. After discovering our common love of history, she lent me books about our village and the area surrounding it. Seems it was quite a busy place back in the day. Our home was originally the general store, which I’ll share more about in a future post. In the summer this is a bustling tourist and cottage community but during the winter it’s fairly quiet, at least as far as traffic goes. Village life itself, however, remains busy. Every month there are events and the post office is the place to find out what’s coming up. Included in our mail is a regular newsletter listing all the happenings: community dinners and breakfasts, hay rides, picnics, bonfires, game nights and concerts at The Evergreen Theatre, which is just up the road. We’ve discovered the joy of village life. Life here is also very personal, less anonymous. People made a point of welcoming us to the community and invite us to village activities. And funnily enough, it’s working. Joseph Campbell was onto something when he advised “Follow your bliss”. I’ll write more about our village and life here in Nova Scotia in future posts because it’s an integral part of my creative journey these days. What about where you live? What feeds your creative life? Previous post: Welcome to my studio. I couldn’t be happier for you both. Small towns are great. Cheers! I absolutely love the blog. Put me in your list!! We are starting to feel the same about our community…from the neighbour who will use a backhoe to clean out our 125′ driveway for $20 to the neighbour across the street who has invited us over to welcome in 2017, it’s a true community who cares for one another. In my biz they always say your in the right place at the right time….well I know we are. Happy new year Aprille!!! So glad you found Home as well. What a perfect start to 2017! Happy new year to you as well! Love your blog Aprille. I always feel such peace and gentle happiness when I read your words. Thank you for that… and I hope we will visit each others’ little bits of bliss in NS and NB! Thanks Ali. Once the weather settles we should make plans to get together .